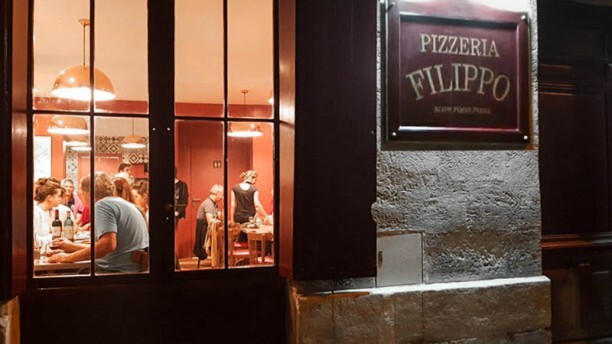 Wow, what a Pizza and what an ambiance somewhere lost in Bordeaux. A place to be for really good food! Very good pizza, staff very friendly, seating etc. a little cramped and basic, but overall a pleasant experience. Great second visit. Pizza is fantastic. Excellent place, fantastic pizzas, delicious desserts. For sure we will come back! The pizza and the home-made dessert lived up to the reputation of the restaurant. This small restaurant projects a warm and welcoming atmosphere. Superb pizza and we love the restaurant! Delicious pizza and friendly service. Wonderful. Delicious pizzas!! Tasteful and made of organic ingredients. Very small restaurant, you'd better make a reservation. Some of the best pizza I’ve had. Absolutely delicious. Tasty fresh pizza , had the pesto pizza!. Good friendly sevice really helpful, even with our limited french! We Ordered prosecco (Wasn't great) should have stuck to the red wine.! restaurant tucked down a little side street really cute..
Excellentes pizzas, de vrais desserts maison. Un service agréable et attentionné. Great atmosphere and the food was excellent! Excellent pizza and very friendly owners.